← Saskatoon, Canada. May 30th, 2011. Syracuse, New York. June 2nd, 2011. If a giant sinkhole has to open on your festival site, the one that opened this morning where the Taste of Syracuse is setting up is in a pretty good spot, the show’s director said. The pit at South Franklin and West Washington streets is less than 200 yards from the main stage being erected in a parking lot across South Franklin from the James M. Hanley Federal Building. Pam Levine, the event’s director, said city workers have assured her it will be filled in by Saturday night when blues-rock superstar Gregg Allman is scheduled to perform. The stage faces West Washington Street. The West Water side is backstage, and Allman’s tour buses are the only vehicles that will need to get through the intersection to park there, she said. The annual celebration of regional cuisine takes place 11 a.m. to 11 p.m. Friday and Saturday on Clinton Square and West Water Street. 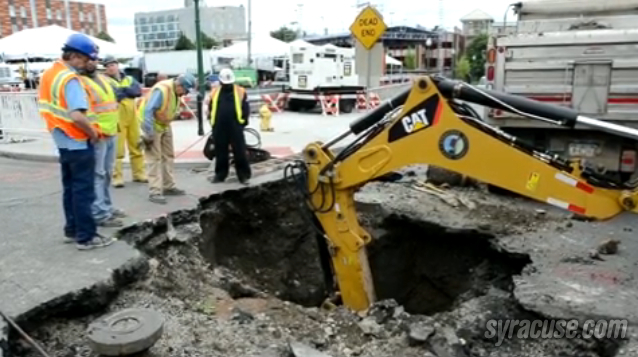 The sinkhole started out about 5 a.m. as a pothole some 2 feet across and 2 to 3 feet deep. By midday city Water Department workers using a backhoe and hand tools had carved a pit in the pavement large enough to hide a small car as they sought the sinkhole’s origin. The cause was a crack in the elbow of a 12-inch main perhaps 8 feet below the pavement, tucked against the brick wall of a manhole. Water gushing from the crack probably undermined the stony fill above it, causing the pavement at the surface to sink, workers said. Bernard Shuler, the Water Department foreman overseeing the repair, said he hoped to fix the crack by placing a sleeve over it. It later became apparent that the placement of the crack made a full repair necessary, Water Commissioner Deborah Somers said. Workers widened the hole further so they could work around the high voltage power line and sewer works that run close to the stricken main. Somers said her department would stay on the job till it was done. “We’re going to have that hole filled for the Taste of Syracuse,” Somers said. Water service downtown was rerouted so service was affected by the break, she said. Other than a giant sinkhole opening on the festival site, the setup has been going perfectly, Levine said. It would have been far worse, she said, if the hole had opened during the festival and people gotten hurt. This entry was posted in Pictures and tagged New York, sinkhole, syracuse, water main. Bookmark the permalink.